Yet another long weekend has come to a glorious end and the beginning of September. Only a few more weeks left for the Nature in my place to lose its vigor and to get frozen. The beautiful flowers, the colors and the lushness is going to fade away and a white frozen tundra is on its way. Yesterday, I spent some time in my garden embracing the beautiful flowers and plants. Some of the plants have started turning yellow and soon it will wither and die; that sight is going to bring me so much pain. The thought of having it all over again fresh and crisp next year soothes me a bit. I seldom pluck flowers from my garden as I like them happy and cheerful on the plants. 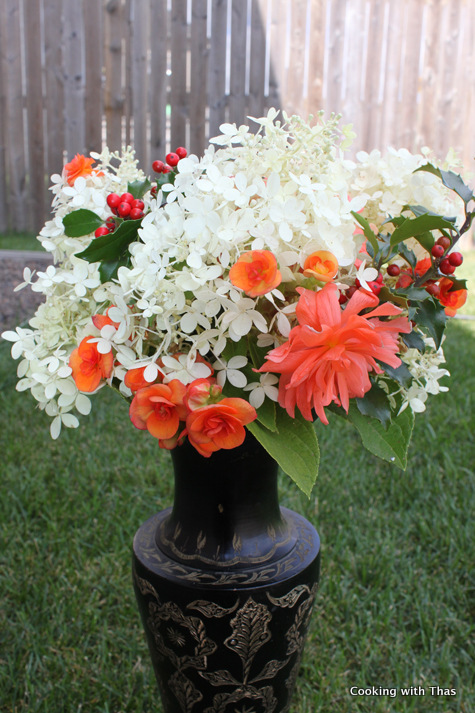 However, yesterday I was tempted to make a flower arrangement with the flowers from my garden. I made sure to pluck only the over grown flowers so that there are still flowers left on those plants. September is the month of hydrangeas, they bloom like crazy and many flower bunch are found on one plant. If you are tired of having chicken salad, I share with you all this squid salad. I made the salad dressing from scratch as well, I wanted a tangy dressing so I went with red wine vinegar. To make it a bit creamy I added mayonnaise to the dressing. It was absolutely delicious and the squid made it taste even more better. I used already cleaned squid, cut the squid into 1 inch rounds, use the tentacles too. In a bowl, marinate the squid along with ground pepper, paprika, ground cumin and salt. Keep aside for 10 minutes. Place a pan over medium heat, add the oil. 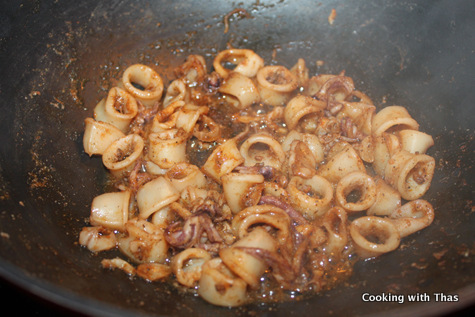 Add the marinated squid to the oil, saute for a minute. Cook the squid covered till it turns tender and cooked well. 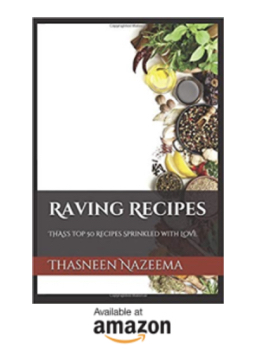 If the water dries off, add little by little and cook till it has done. Keep aside the cooked squid. In a measuring jar or bowl, whisk the red wine vinegar and mayonnaise till it has combined well. Add oregano, ground pepper, salt and chopped jalapeños, combine well. 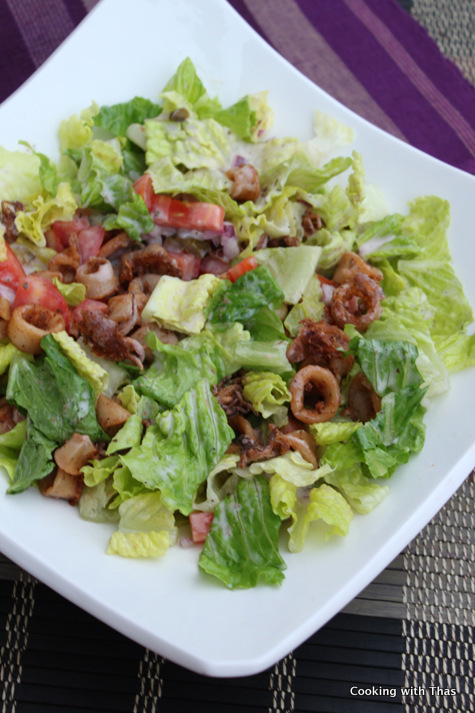 In a salad bowl, combine lettuce, tomatoes, olives and red onion. Pour the salad dressing over it and combine well. 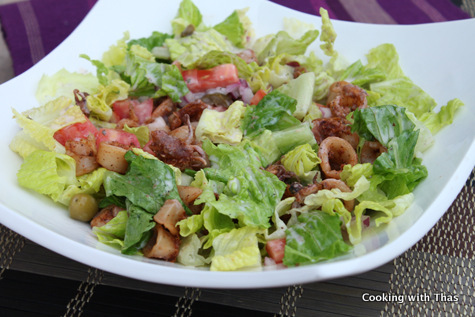 Top the salad with cooked squid.